The 2nd half of the 35th Cornell Real Estate Conference was an engaging session consisting of a speech by the recipient of the Industry Leader Award of the year, Jonathan Rose, followed by two major panels. Mr. Rose spoke about his recent book ‘The Well-Tempered City’ that covers the major trends that affect cities and urbanization. Population is moving into the cities and as a result the rising middle class is consuming much more. This is good for economic growth but environmentally unsustainable. 98% of the resources that enter a city, leave the city within 6 months as waste. Cities need to be much more resilient to weather climate change with attendant droughts and heat waves, income inequality, educational and health disparities, aging, housing insecurity, migrations, and many more problems. Mr. Rose suggested several solutions to deal with the complex web of issues faced by cities in his talk. Doug Yearley, CEO, Toll Brothers. The discussion centered around the current trends in demographics and home ownership are reshaping the single and multi-family housing sectors. The panel provided an opportunity to hear from leading developers of housing on the surprising evolution of the products they are building, the amenities they are adding and subtracting, and where they are building in response to shifts in consumer demand. There has been a change in home ownership patterns of millennials due to late marriages and subsequent moves to suburbs. The average renter is now 35 years old and spends 30+% of his / her income on rent. There has also been a change in how people would like the layout of their apartments. Open spaces are preferred, with nicer kitchens and closet areas but overall smaller apartments to accommodate lower rents. Brad Greiwe spoke about how real estate technology companies such as ‘open door’ are impacting the market space. The physical world interacting with the digital world is the biggest opportunity to take advantage of. Technology will impact how we value our assets. Technology is also impacting space configuration. Ollie is offering transformative furniture that has multiple different uses. There are several platforms for help in finding a roommate. But the key impediment is affordability in cities. The solution to this problem is finding innovative ways to utilize space and shrink usage. In fact, micro units are doing well not only in tier one cities but also tier two cities. Live, work, play is a major trend that is driving demand in the urban core due to experience seeking behavior of millennials. According to some of the panelists, the American dream, i.e. ‘the life in the suburbs’ is still alive but it is taking longer for the millennials to be driven towards it. The 2nd panel covered ‘Mega Trends in the Real Estate Job Market’, a session widely awaited amongst the 100+ Baker Program students in attendance at the conference. The panel was moderated by Lynn Zuckerman Gray, Founder & CEO, Campus Scout. Campus Scout focuses exclusively on the college, graduate student and recent graduate space, Campus Scout is the best solution for establishing or retaining a strong brand on campus and building the finest “bench” of entry level professionals. This panel was aimed at understanding ‘How they work, Why they chose to work where they do, and How they expect the Real Estate Job Market will adapt to changes in how we live, work and shop. The panel was interesting as the audience learned of each of the panelists’ personal story for success in the industry. One of the important pieces of advice shared was to seek the right cultural fit with employers rather than chase monetary gains. Another opinion that echoed strongly in the room was DIVERSITY. For firms to employ the best talent in the industry, employing candidates with diverse backgrounds was considered essential. 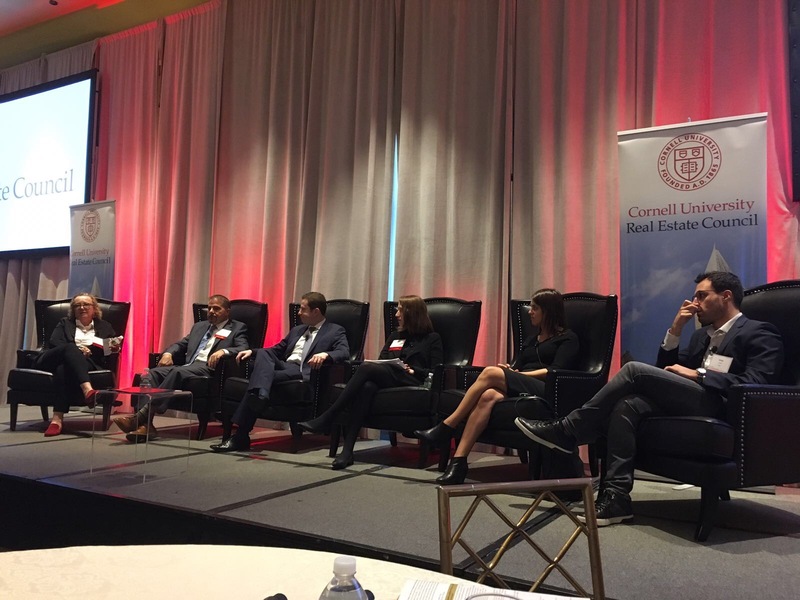 The closing remarks from Paul Rubacha, Co-founder and Principal, Ashley Capital, encouraged all Cornell alumni to be more deeply involved with Cornell’s real estate program.